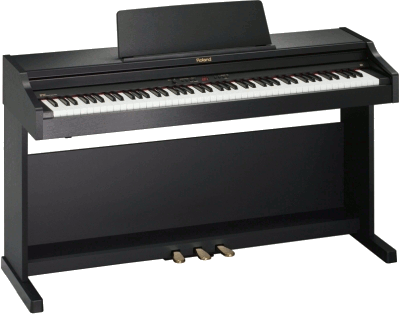 The new RP-301 is a good entry-level piano for students and amateur pianists, with great touch and realistics sonority. With practice-friendly features, like onboard metronome, recorder, and Twin Piano, this piano has been designed with skill building in mind. The SuperNATURAL Piano engine delivers incredibly realistic sound and response, and the Ivory Feel-G keyboard is pure luxury. The RP-301 incorporates Roland’s SuperNATURAL Piano engine — a cutting-edge technology derived from the flagship V-Piano as well as 88-key stereo multisampling. SuperNATURAL Piano brings a new level of authentic sound and natural performance to the digital domain. Roland’s engineers relentlessly analyzed the complex, ever-changing characteristics of concert grand pianos, faithfully capturing and reproducing the tonal variations based on the velocity of each keystroke. With SuperNATURAL, three key elements are dramatically enhanced: velocity response, note decay and key-range behavior. The end result is an incredibly expressive and authentic sound that blurs the line between digital and acoustic. Featuring Roland’s acclaimed Progressive Hammer Action design with Escapement, the RP-301’s Ivory Feel-G keyboard inherits the functions, appearance, and texture of keyboards found on our flagship pianos. Thanks to a combination of advanced sensor technologies and our SuperNATURAL Piano sound engine, the RP-301 offers expression and performance that rivals high-end pianos. The RP-301 is equipped with friendly features to enhance your skills. The Twin-Piano feature, for example, is designed for side-by-side lessons or performances with a teacher or duet partner. It enables the keyboard to be split into two parts, each of which covers the same octaves. This makes it easy to see and hear when practicing beside a teacher. In the same way, the left and right pedals can be reassigned to act as damper pedals for either side of the split keyboard. The RP-301 also has built-in metronomes and recorders, so you can practice with a perfect time reference, and record and listen back to your performances. The built-in song library includes a selection of classical piano etudes — great for practice sessions. With the RP-301, you can play day or night, year after year, and enjoy perfect sound and performance. Since the instrument is fully digital, there are no strings to tune, and no need to worry about temperature changes or aging strings. Furthermore, the RP-301 gives you the choice of playing through its built-in speakers, its external output, and/or through headphones so you can practice privately day or night without disturbing your neighbors. The built-in external input lets you connect an audio player for play-along fun.